Need to get your files to UniPrint? Here's how to do it. Is your document ready for print? No, I need further design work. No, the file I wish to send won't need to be printed. 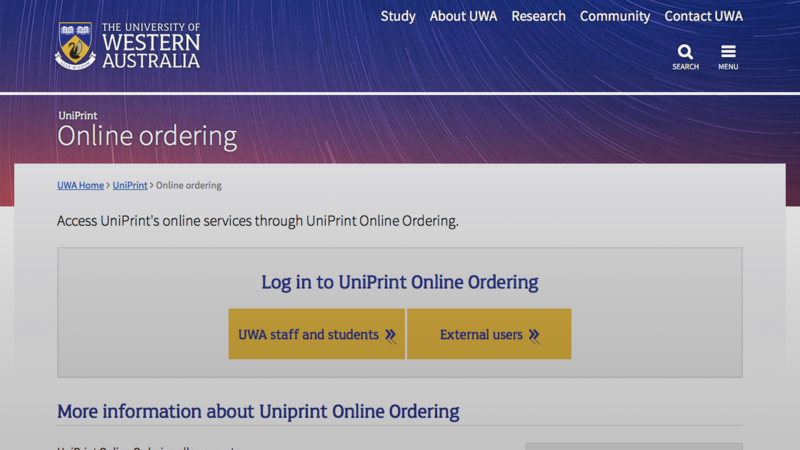 Are you a UWA staff or student, or already have a UniPrint Online Ordering account? Is it likely that you will be sending UniPrint further jobs to print? Do you have a file larger than 10MB? a UWA staff or student? Do you have a DropBox account? 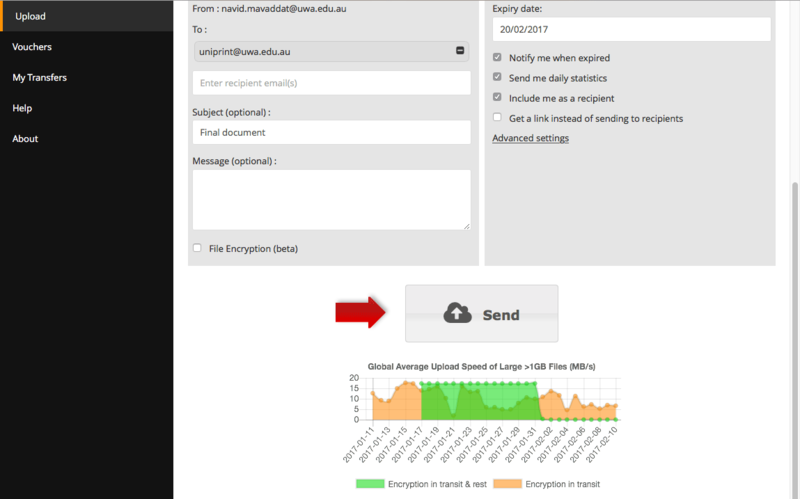 As part of the internet services provided by AARNET, the University has access to a cloud-based file transfer system called CloudStor. 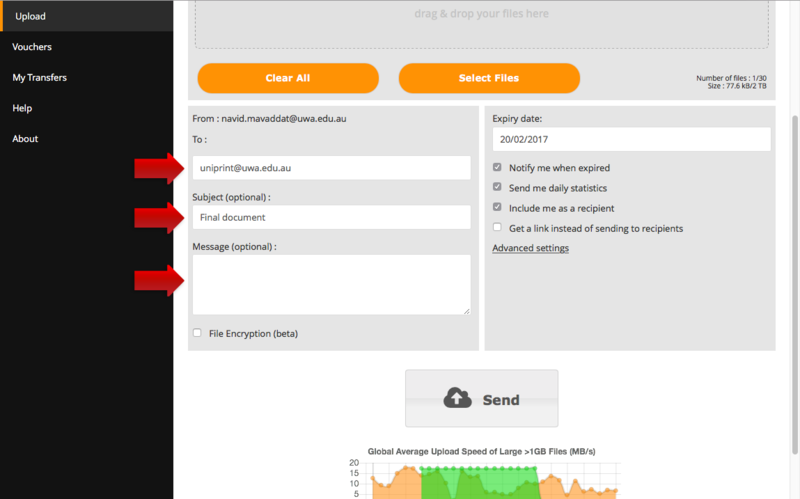 This allows anybody with a UWA staff or student ID to log in and upload files of any size, and include a destination email address. Cloudstor will then email a link to the file to the intended recipient. No login is required to retrieve the file. It is free to use. 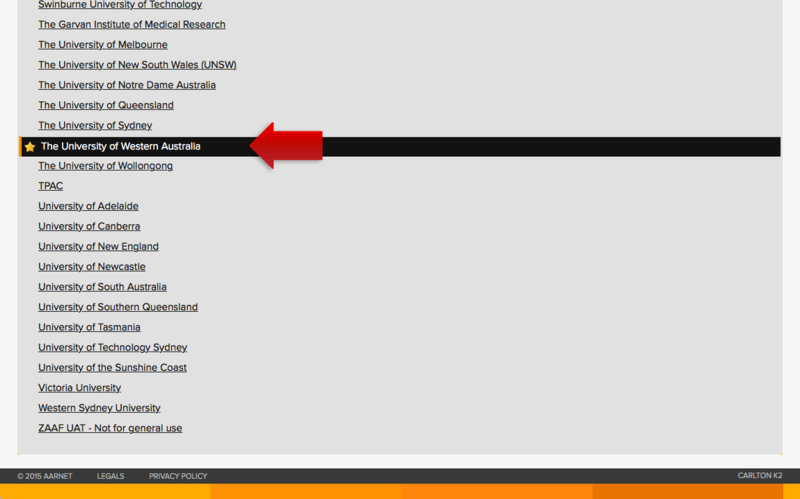 Scroll down to find 'The University of Western Australia' link. Select The University of Western Australia from the list of institutions. 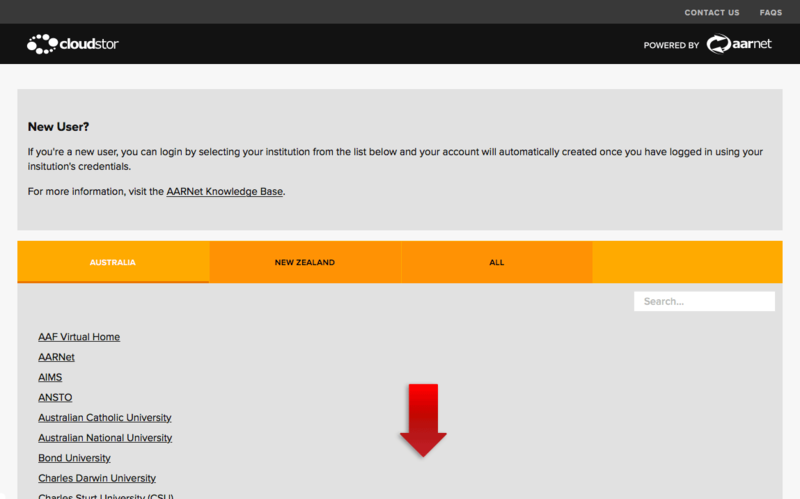 You will not need to select UWA on subsequent visits to the site. Log in with your UWA staff/student ID and Pheme password. You may be asked to confirm your details after this step. 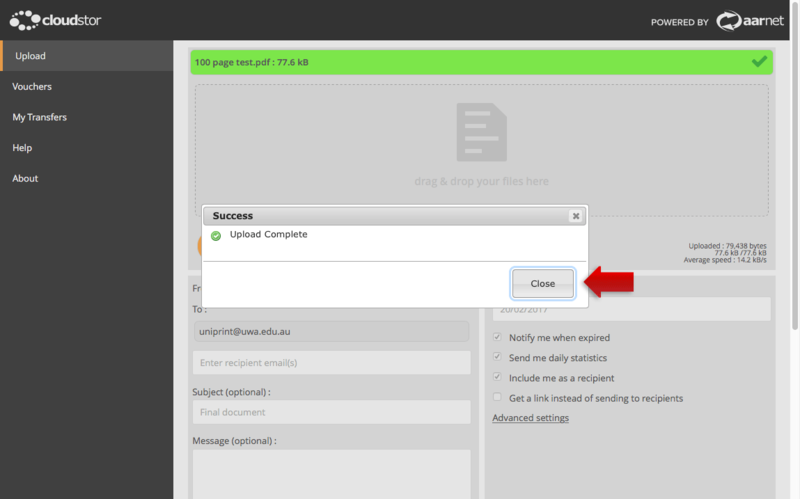 Click on 'Select Files' or drag your files into the 'drag & drop' area. 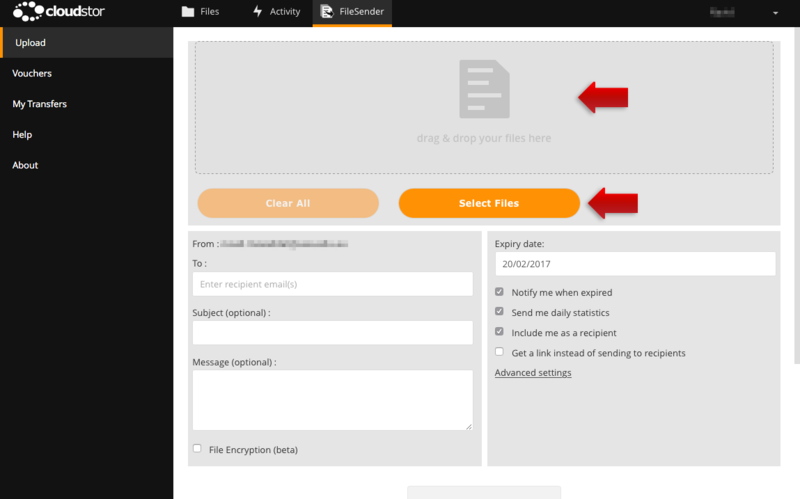 You can either click the 'Select Files' button to browse your computer to fine the file you wish to upload or alternatively drag the file into the 'drag & drop' area. Check files queued for upload. The files queued to be uploaded to Cloudstor will be listed at the top of the page. Enter a descriptive subject and message so that we can identify what the files are for. Click 'Send' to send your files. Once the upload is completed you will see a dialog box indicating this and you can close the dialog box to see the transfer details. You will receive an email response once the email has been sent. You will receive another email once the we have downloaded the files. If you have chosen to 'share a link' keep a copy of the link. Send us an email to inform us of why you have sent and what you would like us to do with it. If you have chosen to 'share a link' to a file or folder don't forget to send us a that link! Registrations are normally completed within one business day. If your job is urgent, you can use PrinterFace as an unregistered user or contact our support staff. Once you have received your registrations confirmation proceed to UniPrint Online Ordering to login. Log in via the UniPrint Online Ordering page. Follow the instructions within UniPrint Online Ordering to submit your document for print. You can use PrinterFace as an unregistered user, or access a wider range of options by registering first. Go the the DropBox website to register a new account. Don't wish to create Dropbox account? Please contact us by email (uniprint@uwa.edu.au) and we will help with alternative arrangements for you to get your files to us. 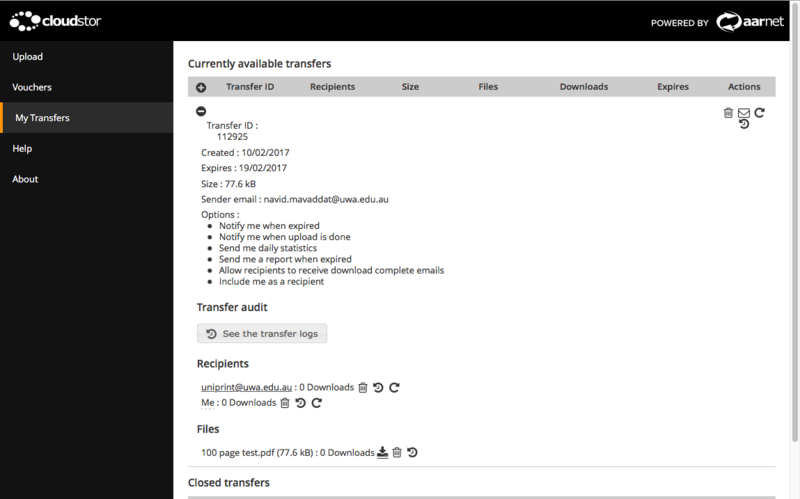 Send your file to us as an email (uniprint@uwa.edu.au) attachment. Be sure to inform us of what you have sent and what you would like us to do with it.